Earlier this week, 180 Medical partnered with the Oklahoma Blood Institute (OBI) to give our employees a chance to volunteer to donate blood. This is just one of the many ways that we at 180 Medical get to change lives and give back to the community. According to the Red Cross, just one person’s donation can save up to 3 lives! One of the main reasons for giving blood is the desire to help others. That kind of thinking fits perfectly with 180 Medical’s philosophy of helping others and turning lives around. Many of our employees jumped at the chance to help out. In honor of each donor, a monetary gift to the Global Blood Fund was also made. This gift supports blood centers that may lack equipment and supplies. Do you want the chance to save lives too? 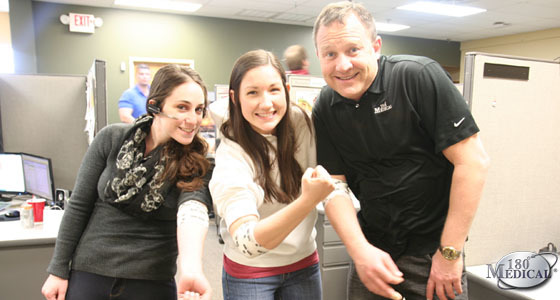 Find your local blood donation center at www.redcrossblood.org. 180 Medical has been named as a recipient of the Better Business Bureau Torch Award for Ethics in 2016. Find out more about the award and what sets our company apart from the other catheter and ostomy suppliers on the market today. 180 Medical is participating in Corporate Compliance and Ethics Week from November 5th to the 11th this year. Find out more about our commitment to integrity and ethics and a little more about our Compliance Department and the important work they do in our latest blog. 180 Medical held its 4th Annual Chili Cookoff recently. Check out the fun we had!